A final beta update has been released (a few days early, notably). Details posted in a forum post celebrating the launch, where Klei founder Jamie Cheng (Bigfoot) talks about the progress and added features to the fully launched game. The changelist for the beta patch includes the fully completed ‘Adventure Mode.’ This one involves some story line as you explore and survive with the hope of discovering Maxwell’s secret, and why the character has been taken to this mysterious world. Every playthrough presents new challenges. Exploration and adaption is key, and only the best survival experts will make it all the way to the end. 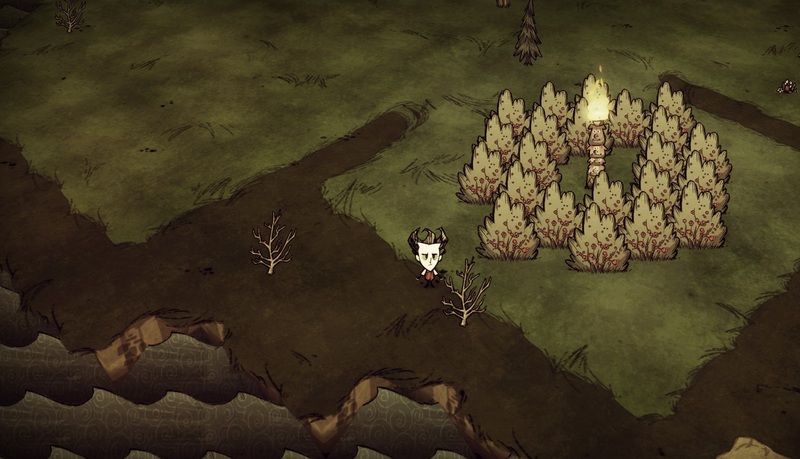 Don’t Starve manages to create a survival experience, while still keeping a relatively friendly early game to make the player able to adapt to the weird surroundings. There is always a real chance for survival, provided you have the vaguest idea what you’re doing. We’ve gone through the game screen by screen and made everything look nicer and be more functional. The world customization screen in particular got a complete re-write. There’s also a new credits screen. This is everything that was listed in the forum post. Bigfoot claims that listing everything would “ruin the surprise” so I’m sure we will all be looking forward, finally, to the launch of Don’t Starve. Keep in mind that the game is available via the official website on special offer until the title’s release date on Tuesday. There is also an expansion planned some time post launch, but Klei are still working out the details on that.